Thank you very much. I am sitting in Singapore! If you are not going to make the offer worldwide, then don’t send the message to those outside the UK. That is not rocket surgery, it is just lazy (and yes, I know all the arguments about cottage industries, mum and dad industries and so on but really, how hard can it be? Skytrex uses a reasonably sophisticated shopping cart so they have the ability)! 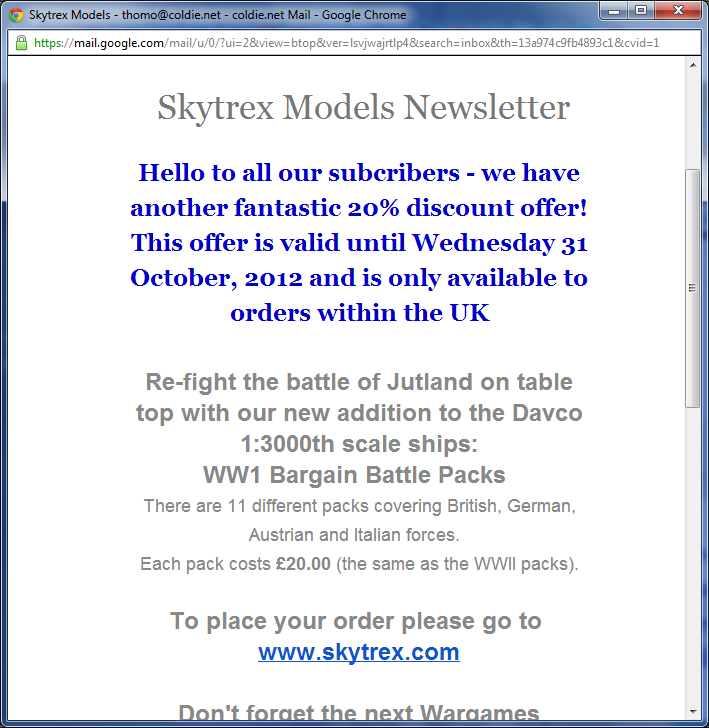 But why would you want anything from Skytrex anyway? I know that’s harsh, but realistically, most of their output is still 1980’s quality and just not up to current standards. Whilst that is mostly true their Coastal Forces stuff is quite nice. Hello to all our subcribers – if you have been trying to order from our website, you may well have been one of many who have experienced our Oops!! Really sorry for the frustration this will have caused but our server has had problems. Our Techno Wizards are on the case and hopefully normal service will be resumed as soon as possible. Of course, it only applies to UK customers still.